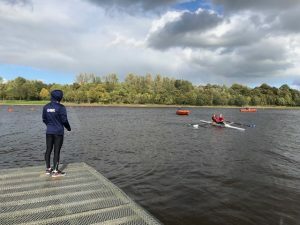 Some of our club members took part in Scottish Rowing and British Rowing’s level 2 coaching course at the Scottish Rowing Centre at Strathclyde Park this weekend. Eight of our members are now trained to coach thanks to funding from Sport Scotland. It gives the club the ability to get more people involved in the sport. A special thanks to Sophie Warburton who put our guys through their paces. Club kit from Godfrey Sports Clothing. You can order individually, or take part in a club order window to take advantage of our club discounts on items. Challenging conditions at yesterdays Scullers Head made for a shortened 3k course and some extremely fast times. Out top sculler, Calum Young, led the GRC way coming second overall to Ben Parsonage and winning the Res2 category. James made 3rd Open sculler and Ronan came in as 2nd Res2 sculler and Blair coming in only 9 seconds behind Ronan. Fantastic results all round and especially for Calum who needed only 2 seconds, which may have been gained by a more efficient course being taken, to win the event overall. Catriona Scott did superb winning Women’s Novice Singles ahead of the winner of Res2 making her the 3rd placed Women’s events competitor. Jo Thompson flew down the course leading the times for the event being beaten only by the handicap system for age categories. Sorry Jo, you’re just too young :). Windy and wet conditions all week. Fast flow following previous week flooding, GRC did fantastically managing to race 2 veteran eights. Though we didn’t get very high on the results page, we raced valiantly and showed determination against some fitter and (much) younger crews. 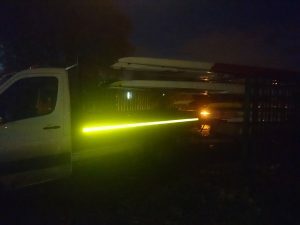 GRC filled a trailer with 6 fours, 5 doubles and 4 singles and headed off up to Inverness with Strathclyde University Boat Club to race. After recent inclemant weather and the water leaving the Clyde, a tree had made it’s way to the Dalmarnock bridge and got lodged just below it. Due to this raising safety concerns, they shortened the course to a meagre 3k. GRC battled hard and noted some good results with several new entries for this years event. GRC’s Scotland Rower Calum managed to pull out the stops in the clubs Empacher single (due to Calum’s usual boat being broken the previous week) to finish fifth. New member and former Castle Semple sculler and rower, Steve Conner, took a slight detour after Rutherglen bridge embedding himself firmly in a tree which took several minutes to get free of (this is quite serious in a time trial event). Steve and captain Steve took to the double in the second division and succeeded in completing the course to finish in a respectable 15th place. This year’s Nithsdale Regatta was an absolutely glorious day with some extremely fun racing and delicious cakes on offer. The course, with it’s excessively tight course, proved quite daunting for many competitors with steering being the letdown of many a capable competitor. GRC had limited representsation with the 3 veterans, 2 seniors and 1 junior representing the club in a number of events. Combining with SUBC, ABC and CARC made for quite a busy event for us. Having an early departure (4:30am), we utilised the towing hire services of 4×4 Hire Scotland to get a vehicle capable to dragging ours and Strathclyde Uni’s fleet of boats all the way to the South Scotland town through their Guid Nychburris celebrations (24hr drinking and horse riding event – they don’t go together 🙂 ). We managed to come away with a number of successes on the day. 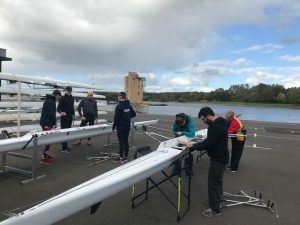 Racing at the Scottish Championships at Strathclyde Park on the 9th, 10th and 11th June was quite a daunting task this year with winds billowing and waves growing, there was no let up. Eventually the organizers switched it to a time trial event where there was a free start and racing timed between start and finish. This led to some confusion but there was some good results and some of our younger competitors did amazingly well. Fantastic weather, glorious sunshine and a very gentle tail wind gave play to some fantastic racing on the Saturday. The wind started to get up a little on Sunday but this didn’t dishearten the GRC massive. Great congratulations have to go out to our J15 sculler, Adam, who brought home a win in a mixed double with Clydesdale ARC on the Saturday. Congratulations also to Robyn who managed to lose her Novice status at this years SPR. Never mind Robyn, you’ll still be able to race novice again at the Scottish Champs :-Þ. Great thanks go to those who helped and supported the rowers competing at this event and to those who helped get them there and back. We’ll be looking to get all our boats re-rigged by this Saturday morning so please make sure you lend a hand then too. Thanks also go to Clarkson’s van hire from whom we hired a Bi-Turbo van which pulled our trailer with ease. Congrats to all those competitors who managed to make it across the start and finish lines at this years SUBC HoRR on the Clyde. GRC had a couple of exciting entries of which we had 2 veteran double sculls competing in the Masters event. Bryan and Peter managed to pull a powerful shortened course in a time of 9 minutes and 16 seconds having had to suffer freezing temperatures and lengthy weights in tough water conditions before being set off. Pinoke and PT (we have to name all our Peters differently :-D) set off shortly after and stormed down the course in a quick time of 9 minutes and 19 seconds and with the correction of the Masters Handicaping System, managed to lift the pot for the event. Our university students, Katie and Robyn were down to compete in the Women’s open singles event (far above their points tally) to get a measure of each other in the time trial event. Unfortunately Katie was unavailable due to illness but hopes to be back to fitness for the next races and trials. Robyn powered down the course in a time of only 9 minutes and 34 seconds. Here’s looking forward to the rest of the season for this competitive pair. 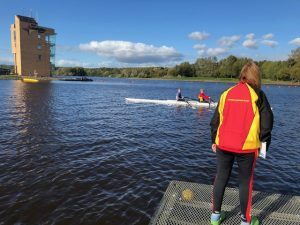 An absolutely outstanding result for our 2 members attending the Inverness Fours and Small Boats Head accompanying Strathclyde University Boat Club. Robyn and Katie managed to win every event they entered with them bringing home pots for Mixed R2 Quad, Women’s Novice Single, Women’s R2 Single, Women’s Open Single and finished off teaming up with a win in the Women’s R2 double. Fantastic day at on the Clyde today. Over 90 crews raced over the 5km race course from Belvedere (nr the Cris Hoy Velodrome) to the monument on the Glasgow Green where the Glasgow City Council were setting up the fireworks for the evenings display. GRC had 2 rowers in the competition with Adam Robertson competing in the Open Junior 15 Coxed Quad with Strathclyde Park RC and Rebekah Kitteridge competing in the Womens Restricted 2 Coxed Quads with Stirling ARC. Copyright © 2019 Glasgow Rowing Club.